Tuesday 22nd - Sydney's Old Burial Ground archaeological site under the lower ground floor of Sydney Town Hall was open to the public from 11am to 3pm. Thousands queued to see the site. Several members were among those thousands. At least one had an ancestor buried there. change on the posts . 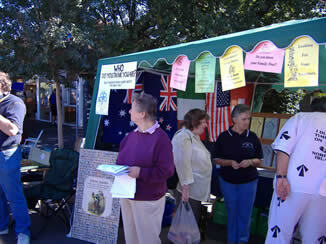 Saturday 26th - information booth, stall etc at the AUSTRALIA DAY function at Glenbrook Park. Several members had a very busy day answering many varied enquiries. Interest seemed even greater than in previous years, presumably due to SBS screening of the BBC & Australian series of "WHO DO YOU THINK YOU ARE? ". Friday 8th - general meeting. Ian Walker of Search Tech Scanning outlined the work of the company in digitially recording historical materials for government an commercial enterprises and the challenges of keeping the material upgraded as technology changes. Much of their work is preparation for the historical digital images now available on internet sites as well as for tourism.We need to think of the same issues related to out digitised photos & documents. Unfortunately his computer was out of action and we did not see examples of their work, but many well known internet sites carry examples. & Sunday 9th - Family History Fair by Nepean FHS at the same venue. We were at both events and had a wonderful time meeting so many of you interested in our region in general, had ancestors who lived here and answering so many queries. We also had the first copies of "Parramatta: Sites and Sights" on sale as well as buying many publications for our library. Family history is alive and well! 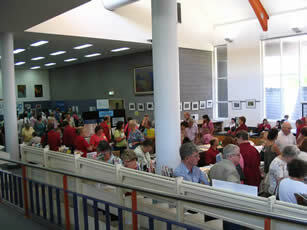 Thursday 13th - a well attended research day at NSW State Records at Kingswood. Successful too - everyone found something they needed! Friday 14th - The workshop on Memories of WW2 was most successful. Attendees divided into 3 groups - roughly those who remembered the war & those who remembered their parents' stories & those from overseas. Each had a group leader & a recorder who had trouble keeping up as members' memories were sparked by other's comments. We covered rationing, school, Japanese subs in Sydney Harbour & the shelling a few days later, blackouts, petrol rationing and even gas producer cars etc. Particularly interesting was the contrast between those growing up in Sydney and in country NSW. Some groups set homework - write up what you can recall, so there will be more on this topic. Saturday 5th - Springwood Foundation Day. As usual BMFHS was there in Macquarie Street - this year outside the Turning Page bookshop... and what a busy day it was! Thursday 10th April - Blessing of the Bonnets at St John's Church, Parramatta. This is part of Christina Henri's "Roses from the Heart" project to recognise and commemorate our female convicts. Many members have made bonnets for their own ancestors and others, each embroidered with a convict's name and accompanied by a short biography..... and were present to add their bonnets to the symbolic wooden boat. Left - Example of a bonnet with biography of Mary Tumilty, of the John Renwick 1838. Right - Suzanne with the boatload of bonnets, scattered with rose petals. Friday 11th April - general meeting The speaker was well known Katoomba auctioneer, Steve Archer of Archer's Auctioneers & Valuables Pty Ltd. Steve dwelt on some of the delights of being an auctioneer including some valuation aspects auctioneers encounter, including of rare pieces. He finished by identifying some family treasures, mainly jewellery. Thursday 7th May - Outing to the Police & Justice Museum in Sydney was a geat success. The tour included the court room, old cells, various weapons, the forensic room and some famous cases were outlined. They then visited the exhibition on early Sydney hotels as well as enjoying lunch in the beautiful Botanic Gardens. Friday 8th May - workshop meeting - Education as we remember it. Notes from the groups & individuals were compiled & are available in our library collection. Lorraine Stacker from Nepean FHS again undertook the task of selecting the recipient for the Bob Howard Award for the best, well researched article in the 2007 The Explorers' Tree magazines. Lorraine attended to present to award to Sue Newbury for her wonderful article on visiting her relatives In France. These were connections found through her family history research. The topic for discussion was education - what we learned, discipline, sport, games played, entertainment and so on. Once again, notes from each group and individual recollections will be collated as oral history resources for use by our members. Participation was great as evidenced by the constant talking, and it continued throughout the morning tea break. One of the four groups with so many memories to awaken and discuss. Thursday 15th May - bookstall outside the Westpac Bank in Macquarie Road, Springwood. This was an important fund raiser to enable the Society to purchase more resources. Our sincere thanks to the members who ran the stall and the locals who supported us so well. Friday 13th June - John Low was the guest speaker on "From Inn to Villages: Glimpses of Life in the Blue Mountains". The Blue Mountains formed a barrier to colonial expansion but our ancestors trudged their way across to the goldfields carrying their belongings, pushing a barrow, if lucky riding a horse and maybe in a cart of carriage if among the more affluent... or they holiday here ... etc. John focussed on early conditions of transport with particular reference to some of the difficulties of families crossing to the newly established Bathurst in the 1820s & 30. The conditions of inns, the large groups of navvies as the railway was built and later the fettlers and their families endured conditions we cannot imagine today. John will return at a future date to tell us more! Friday 11th July - Emma Frewin detailed three of the Blue Mountains Notorious Murderers and those murderd in the 1880s and 1890s. It was time to hear some gruesome details of the area in which we now live! Privacy laws prevent us from recounting stories of murder vicitims dumped in the mountains in the last 70 years but we all remember such events while we have lived here - even this year! Saturday 26th July - ANNUAL SEMINAR - WHERE WILL I FIND THEM? As usual BMFHS Annual Seminar was well attended, informative & enjoyed by members, local interested people & some from as far afield as Gouburn. Hawkesbury library & local studies specialist Michelle Nichols sopoke on "Researching Hawkesbury Families". It was a wonderful guide to what may be found in local studies collections in various forms such as documents, diaries, photographs etc. Fiona Burn presented two topics namely "How to Use the National Australian Archives for Research" & later in the day applied this to "Researching Immigration". From delegates informal chatter, it was obvious most had not been aware of many resources held in the NAA. Veteran Affairs historian, Cheryl Mongan's topic was "Researching Military History" with particular aid to finding online data. A printed chart led us to sources in the NAA, the War Memorial, and even more at Veterans' Affairs. As established in an earlier conference we aim for a lighter presentation immdiately after lunch. This was delivered by two members of the NSW Corps of Marines Inc in uniform. They provided an insight into early army life by showing & explaining the items of clothing, muskets and so on. The number of questions was indicative of the interest aroused by this presentation. The program listed Helen Dickinson from the Land Titles office entitled "Unearthing Treasures from NSW Land Records" but unfortunately Helen was ill so Vice-President Joan Edwards spoke about the Changes in Family History including availability, attitudes & related issues. Of course, BMFHS ladies lived up to their well earned reputation by providing excellent morning & afternoon teas and lunch. Wednesday 30th July - outing - research at State and Mitchell Libraries. Friday 2nd - FAMILY HISTORY WEEK commenced. Friday 8th - workshop meeting of "Show and Tell". members displayed, told the stories about & discussed a wide variety of items including pictures, medals, household items and clothing. Friday 12th - Sunday 14th - NSW & ACT Family History Federation Conference at Dubbo. The conference continued wih excellent speakers for the weekend. Friday 10th - Carol Baxter's talk was "Scandal & Scullduggery in early Sydney". It was related to her relatively recent publication & the research involved with comments on the society, laws of the times as well as some of the oddities. We heard of the scandal & skullduggery but not of the outcomes! Funded by BMCC's our first Community Grants Workshop was held at Leura. It was designed for beginners, working through all the basics, etc. It was well attended & aroused considerable interest. Four of our members were responsible for the organisation & running of the workshop. Friday 28th - new committee met. Friday 12 - Christmas function - the last event for 2008 was, yet again, a joyous affair, with sincere thanks to the Meaghers for making their home available, & all the usual workers who looked after the catering, and thought of all the little extras that made the day so successful.